I am currently at the tail end of the Debate Drinking Game, wherein you take a drink every time McCain says “my friends” and Obama starts a response with “Look,”. Since both candidates had their verbal tics under control, I just took a drink every time someone said a pronoun. I am not in a good state. Fortunately Google’s sobriety test has not yet extended to the WordPress default implementation. Why would you ask for the arctan of pi/2? Maybe it will make sense when I’m sober. I did an interview with the New Yorker Cartoon Blog. It’s available here. I will be in Burlington, Vermont tomorrow, to try kite photography. Thanks to the excellent (albeit poorly-organized) CHDK project, I’ve picked up a cheap Canon Powershot A720 and modified it to do time-lapse photography. This makes kite photography much simpler than it’s been in the past. If there are any readers in the Burlington area who are interested in kite flying and know of a good location, email me at xkcd@xkcd.com. I will send out an email containing plans to anyone who contacts me, sometime soon after noon. If you know someone in Burlington (e.g. at UVm,) let them know! Thanks. cuntmachine: if you put it that way, i think actually Randall lampshades that Europe isn’t “the world” either. so yeah. Dude, xenocide is totally better. If you do draw a comic telling everyone to send you twenty bucks, be prepared to receive plenty of bobcats. 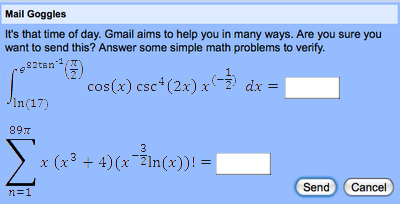 I was very disappointed to note that Google’s Mail Goggles sobriety test doesn’t actually have integrals and summations, just arithmetic. In fact, it hardly seems to get harder with difficulty from 1 to 5. Waiting for more Good website this makes me want to write something. I’d really appreciate it! Great news! Thanks a lot for sharing! This issue is discussed all over the Internet. Interesting to know that every where it is spoken about is a different thing. Great post I would like to thank you for the efforts you have made in writing this interesting and knowledgeable article. I’m waiting for next post. I was extremely pleased to discover this great site. I want to to thank you for your time for this wonderful read!! Thank you for posting such a great article! I found your website perfect for my needs. It contains wonderful and helpful posts. Hopefully you’ll continue sharing your knowledge around. I’m impressed, I must say. Really rarely do I encounter a blog that’s both educative and entertaining. La ringrazio molto per aver scritto un articolo così interessante su questo argomento.